Many of our first-time patients are those who come to us because they are suffering from chronic pain and they’d like to avoid relying on pain medications for relief. While prescription and over the counter medications can work well to alleviate and mask chronic pain, we see many patients who are interested in getting to the root of their pain in hopes of eliminating their problem altogether. What many don’t realize is that pain relief is just one of the benefits that can result from a visit to Caron Chiropractic Clinic in St Paul MN. Take a look at just a few of the holistic alternative treatment options we offer at our St Paul chiropractic office and how they may benefit you. Massage therapy is the ultimate balance to the mind-body-spirit connection. Did you know that massage therapy provides even more benefits than just muscle pain relief and relaxation? Massage therapy is considered a holistic alternative therapy at Caron Chiropractic Clinic and this is why our licensed massage therapists take the time that is needed to properly assess your individual needs to develop a proper approach for your massage session. Aside from relieving pain and inducing relaxation, massage therapy helps to lower blood pressure, strengthens the immune system, assists the lymph system, alleviates pregnancy discomfort, releases myofascial tissue, and improves circulation. Caron Chiropractic Clinic offers a full menu of massage therapies to choose from including everything from prenatal massage to sports massage and aromatherapy, and your massage therapist will be able to work with you to determine exactly which approach would benefit you and fit your needs. Using gentle touch, this form of bodywork uses the fluids that surround the brain and the central nervous system as a therapeutic tool to facilitate healing in the body. Craniosacral therapy normalizes the environment around the spinal cord and brain which allows the body to self correct. The resulting benefit is the relief of a wide variety of issues aside from chronic pain such as anxiety, sleep disorders, vertigo, headaches, and posttraumatic stress disorder. The gentle, noninvasive approach of craniosacral therapy is beneficial even to newborns and children. Chiropractic is the largest alternative health profession in North America for a reason. Our St Paul licensed chiropractors work closely with patients on a daily basis to restore balance to bodies naturally. 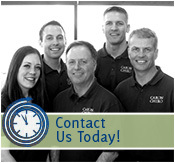 At Caron Chiropractic Clinic in St Paul, each of our patients is treated as an individual whose unique needs are assessed and addressed. Chiropractic therapy provides more than just pain relief. Our patients seek chiropractic therapy to relieve underlying problems for benefits from issues such as headaches, ear infections, asthma, high blood pressure, and stress reduction. For more information about how you and your family can benefit from the natural therapies offered at Caron Chiropractic Clinic in St Paul, we invite you to call (651) 255-9999 or email our office at info@caronchiropractic.com. This entry was posted	on Thursday, June 9th, 2016 at 4:05 pm	and is filed under Chiropractic, Chiropractic Treatments, Chiropractor, Massage Therapy. You can follow any responses to this entry through the RSS 2.0 feed. You can leave a response, or trackback from your own site.